Hello again! It’s been a while since our last post, and a lot has changed. First of all, we have completely ditched Bass.NET for a custom solution using only Monogame (like the rest of our audio) and a decoding library called Mp3Sharp. This lets us play mp3 music through the same channels as our sound effects, meaning, you guessed it, speakers ingame (and robot job) can now play game music! No longer are you stuck dancing to silence. Last month, the simulator underwent one of the largest and most important changes it’s faced recently – the addition of Permissions and checking them. Giving Maxis our spare key. But of course, that’s not all. Alongside many quality of life changes, such as the property list and two person object interaction fixes, we’ve also fully implemented sim budgets in a way that will transfer nicely to the global server. TSO specific game features have always been a priority, since they have not been replicated anywhere else. One such feature, “plugins/EODs”, allows an object to display an interface on the sim’s local machine, and allows it to connect to an “EOD server”, hosted within the object in question. The biggest TSO objects, signs, the nightclub job and pizza, use this functionality extensively to provide interfaces for gameplay simply not feasible within SimAntics alone. The challenge was to implement this “server in a server” system in a way that could easily be extended for all ~20 plugins in the game. As of a few days ago, we were successful! By far the most useful plugin, the dance floor plugin. Playing Pizza on the night of release! However, implementing these three does not mean an easy ride for the remaining ones! Each EOD has a custom server which can be complicated (it especially was for pizza! 8 different simantics events, and ~7 freeso ones) and requires a backing implementation for its UI on the live mode panel. Most of the work is done by the UIScripts, however all functionality has to be implemented by hand… unlike SimAntics, where the simulator drives the object functionality from the game scripts! The Signs Interface. Features 4 different modes, one of much enables a tab to set permissions. 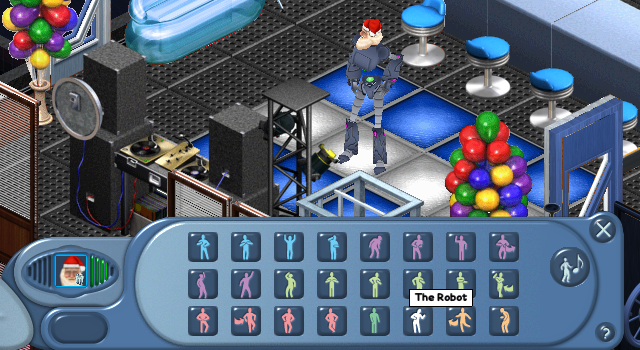 The Dance Floor interface, featuring a cool 25 buttons to queue custom interactions via the Dance Floor Controller. The pizza interface, which must closely follow the state of the object, who is connected to it and the decisions they make. Thank you everyone for following development, and playing what we have so far has definitely been a lot of fun. Great things are to come! ← Volcanic, Terrain, Fixes… and a new Logo! I am still in disbelief that it’s actually going to happen – to be completed! All the let-downs before by other people’s attempts, I am so so so so proud of the entire dev team! Truly I am! You’ve accomplished so much on top of your school work and exams! WOW! 😀 Thank you, thank you!! Hey guys how do I get hold of this game? Am I able to play it at all yet? Check out the forums for instructions on how to download. It’s a little hard to set up, but nearly all objects are usable and the multiplayer holds up pretty well. There is no city yet, so no monetary gameplay. Does this mean that the missing plugins (casino, slot machines, Tomb Hunters of the Lost Llama (Maze), Core Business Unit (Code) and Rock ‘N’ Roadie Portable Bandstand (Band) will be added to have the global server? They can be added at any point, they are just rather complex so some time must be dedicated to implementing them. The global server is not necessary for most plugins. I have downloaded, installed, added the dist zip and the extra packing slips yet when I click on the freeSO application file I get the error message? It’s in C/programfiles/maxis/thesims online/TSOclient so why won’t it work? What is the error message? You should post it on the forums. Will FreeSO be released on macOS? Yes, though it may be difficult to get Mac Monogame builds to co-operate. freeso works on windows 10? Fix the captcha, I have tried many times to create an account. It will not work. Please fix it! I have been trying to enter it properly for days….